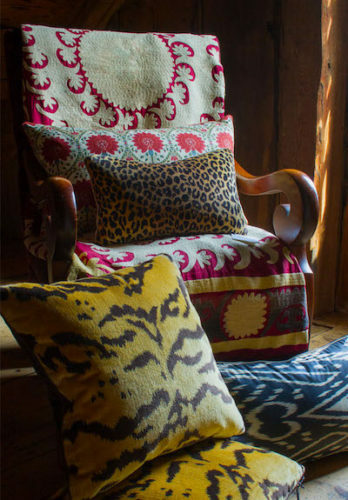 Beautiful fabrics, cushions and interior furnishings fill the Artemisia store in Old Lyme. Artemisia is a new destination shop on Lyme St. behind The Cooley Gallery in Old Lyme specializing in fine textiles, pillows, antiques and decor items for the home from the team of Rosemarie Padovano and Marcello Marvelli. Padovano is an artist and interior designer, and Marvelli is an art dealer and art historian from Florence, Italy. Together, they share a mutual love of art and design. They started the Artemisia Inc. in New York City in 2012 and recently moved it to Old Lyme. The shop will feature a selection of unique objects and furniture that reflect their design sensibilities as well as the sophisticated collection of pillows, placemats, and ottomans that are designed and produced by Artemisia. Featured in all of the most important décor magazines, they are a trusted resource for some of the finest interior designers worldwide. The Artemisia shop will also feature a collection of antique fabrics (Ikat and Suzani, and European silk velvets) as well as unique antique furniture, lamps, and objects selected with a discerning and fresh eye. The shop is also the location of Studio Artemisia, a full service interior design firm led by Padovano and Marvelli. Together they create soulful interiors with a refined and artistic mix of modern and antique furnishings. Vibrant colors and luxurious fabrics are paired with a cultivated selection of antiques, adding visual excitement and warmth to every project. Padovano and Marvelli seek a cultured atmosphere in all they design, honoring both past and present. They have designed residential interiors for clients in New York City, Westchester County, Miami and Connecticut. Padovano and Marvelli are restoring a 1755 colonial house and Olmsted Brothers historic garden in Old Lyme.